Every month we say it, because every month is true. We love our business, we love the work we do, and we love the people we work with: Your Employment Solutions has the best people in the Utah staffing and jobs industry. Our February spotlight shines on yet another excellent example of that. Logan is plain and simple an all-around good man. He takes no short cuts, works hard at what he does, and always calls it as he sees it. Yes, he is the nephew of the President of the company, but nepotism has done him no favors here. Just the opposite. 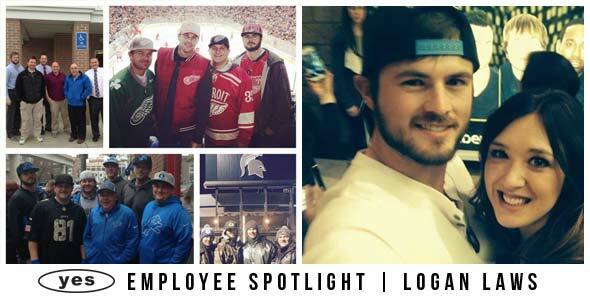 Logan has had to work even harder to prove himself, and his work ethic speaks volume. He's always looking for opportunities to make our company and his team of co-workers better, and I've seen him go to bat for the well-being of our temporary employees on multiple occasions. First of all, I’m just here so I don’t get fined. The thing that I like most about working at YES is the wide variety of skills that one can learn here. This business can potentially teach and cultivate valuable attributes that can lead someone to success throughout any career. One thing that I think would make yes better is a vending machine. I can get pretty hungry throughout the day. Honestly it is hard for me to say publicly what would make YES better. It would take some serious thought and reflection. I truly believe in the product that YES has to offer. I truly believe that the processes that we have set in place will lead us to success. I believe that the leadership that we have in place cares not only about their business, but also about their employees. I believe that even if our product, processes, or leadership had issues, we have the humility and frame of mind to change whatever necessary to be successful. This is a tough question. Usually I would say Michael Jordan without even flinching, but I hear he is a kind of a jerk in person. I would want to meet someone within the sports world that is also a businessman that I could learn from. It would be a tight race between Michael Jordan and Mark Cuban. This of course assuming that after meeting them I could pick their brains for a couple of hours. My favorite place in the world is ARGENTINA. It is a place where I met some of the greatest individuals. It is a place where I fell in love with another sport. It is the place where I learned to work harder then I even knew I could. It is a place where I served my God. 7. If the Green Bay Packers played the Indiana Pacers in the World Series, who would win? Why? The answer is Chuck Norris, you know why! The number one challenge that I face at my job is trying to keep everyone happy. Balancing clients, employees, internal staff, management, and my own expectations is the biggest challenge that I think a lot of people face here. But that balancing act is something that we have tried to improve and focus on. There isn’t a correct answer when trying to solve the balancing act above. It is just something that needs to be adapted to and worked on. Organization is the key to keeping tabs on everything in my opinion but it’s a constant battle that needs constant upgrade and improvements. I would tell clients or employees the same thing. We care. We care about our product, our people, and our name. We are passionate about what we do and we are dedicated to making work happen for everyone. 11. You’re the Offensive Coordinator of the NFC team in the Super Bowl. You’re down 4 points with under a minute to go in the 4th quarter. You have the ball, second and goal from the 1-yard line. What play do you call? Hand the ball off to YES President Reed Laws and rush up the middle? Or slant pass to YES VP Kerry Westenskow off the right side? My answer is……. Neither. Both are stupid plays. Reed is a walking fumble and Kerry is weak going across the middle. He would get laid out, or drop the pass. I would run the Boise St. Statue of Liberty play to Trevor Hansen for the TD. That’s why they call me the greatest. But if for some reason T-Money can’t score. I would just call on my full back Big Country Reeves to get the job done. Haha, nice Logan. You would assuredly be a Super Bowl champion. Thanks for all the work you do to make Your Employment Solutions the best staffing agency for jobs in Utah! Nice write up. Sounds like a man who was brought up the right way. Go Giants!!! I retract my statemant about Reed fumbling the football on the goal line. He would cover up the football and the lineman would push him over the goal line!